List of the Official Annual International Days related to Forestry, Environment, Wildlife. February 6, 2019 February 6, 2019 admin	0 Comments Environment, List of the Official Annual International Days related to Forestry, Wildlife. 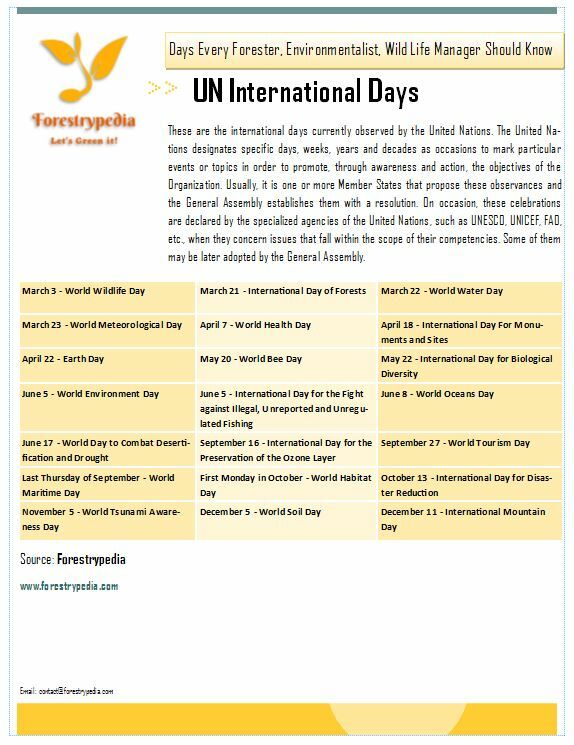 These are the international days currently observed by the United Nations. The United Nations designates specific days, weeks, years and decades as occasions to mark particular events or topics in order to promote, through awareness and action, the objectives of the Organization. Usually, it is one or more Member States that propose these observances and the General Assembly establishes them with a resolution. On occasion, these celebrations are declared by the specialized agencies of the United Nations, such as UNESCO, UNICEF, FAO, etc., when they concern issues that fall within the scope of their competencies. Some of them may be later adopted by the General Assembly. SEE ALSO: What happens when a Plant gets hurt?